Daniel Tighe is only 11 years old, but he is a strong boy and is intellectually disabled, too. By the time he has finished growing, he might stand seven feet tall - but even now, before he reaches his teenage years, his mother Sinead has grown accustomed to receiving an onslaught of slaps as her beloved son's frustration turns into aggression. Yet her plea for the help of a behavioural therapist who might unravel the complex strands of her son's tantrums and violence has been refused by the HSE. "Daniel has pulled my hair, walloped me, and gets me in a headlock… I've learned to have quick reflexes," said Sinead Tighe (45). Daniel is already the same height as his mother and could grow to be so tall because of his 'overgrowth' medical condition called Sotos Syndrome, she said. She wants the HSE to reconsider its refusal to provide her family with the services of a behavioural therapist. For she is worried her love for Daniel is being eroded by stress caused by his behaviour. Daniel has a severe intellectual disability. He also has severe epilepsy. He cannot speak. Neither can he chew or swallow liquids and he gets much of his nourishment through a PEG device in his abdomen. He is incontinent. He suffers from a sensory processing disorder. His eyesight is badly impaired. He is also unsteady on his feet so his family use a type of buggy to bring him out. 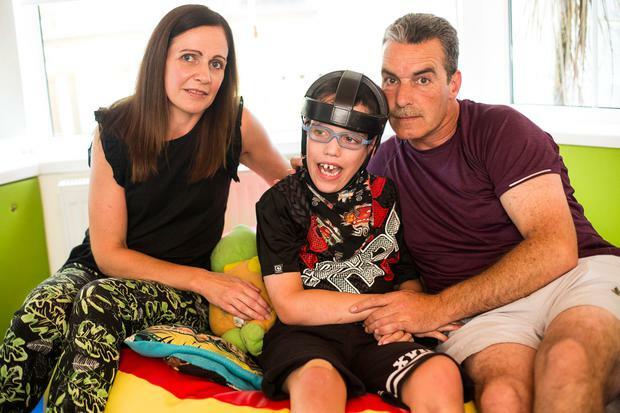 Daniel has several tantrums or 'meltdowns' every day and Sinead and her husband, Keith, have installed a padded sensory room in their home in Tallaght to protect him from injuring himself and to help him relax. They equipped him with a helmet to avoid injury when he bangs his head on a wall. He may scratch his own face and bite his own legs when he is in the grip of an uncontrollable 'meltdown'. "Daniel could have one extreme meltdown a day and six or seven meltdowns throughout the day. "The extreme one is when he is gone to a place of no return. He's just screaming. We lift him into the padded room. He would be throwing himself around the room, screaming, screaming. If he gets anything in his hand, he will throw it at me. Things get broken. I've been hit with them. "I do cry, probably every day. You cry just to get on with it," she said. Keith's career sees him often leaving the house early in the morning. Daniel gets up at 3am most days and Sinead must also get up then to take care of him and to make sure he does not injure himself on the stairs. "We could try and put him back to bed but that would be an unmerciful fight and he'd slap the head off me," she said. Daniel's sister Shauna (14) is loving to her younger brother and helps her parents care for him. She also finds it challenging, at times, said Sinead. "It's often like Daniel is the boss in the house. He demands. He even insists that we all sit in particular places in the room or he will get very upset," she said. As Daniel is incontinent, he receives frequent baths which can also help him relax. Most parents can get a break while their children watch TV or play computer games but Daniel can do neither. "So there is nothing that Daniel can do without me. I've got to be there for him," she said. Taking Daniel shopping can be an ordeal. Some busy shops can 'overload' his senses and upset him deeply. "We can't go into the Square in Tallaght - it's too much for him. He'd scream and scream and scream. In some shops, he might reach out and try to grab someone. Some people just stare," she said. Every school morning, Daniel is collected at his home and brought to ChildVision in Drumcondra, the national education centre for the blind, where he receives excellent care during the day. Daniel is brought home at 4pm daily. The family dog, Sammy, is a source of fun and friendliness for Daniel. Sammy gives Daniel comforting licks. The HSE provide eight hours homecare a week which involves outreach workers arriving to bring Daniel to a local swimming pool or other venue three evenings a week. The HSE also allows the family six weekend breaks a year for Daniel to receive care outside the home while the family get a break. But thanks to pressure on respite resources, they do not receive the amount of respite breaks they were led to expect. This is something the family want addressed. A shortage of respite availability will prevent Sinead from attending her brother's wedding on August 11 as she has no one to give Daniel the care he needs, she said. Daniel will be at home each day for the rest of the summer as his school's holidays began last Friday. Sinead will feel under extra pressure for the next six weeks. Six years ago, in the midst of the constant pressure and daily challenges, Sinead discovered the joy and relief of running. When Daniel is in school, Sinead heads out to run in the nearby Dodder Valley Park and around the roads of Tallaght. She later began to bring Daniel in a special buggy which allowed her to run while he enjoys the view. She did her first Dublin marathon three years ago, finishing in four hours and 30 minutes. Last year, she took Daniel, pushing the buggy, and completed it in four hours and 21 minutes. She does the park runs in Tallaght, pushing Daniel all the while. They are both given times after each run with Daniel always finishing two seconds faster. Sinead set up a Facebook page called 'Daniel's Voyage' in which she writes witty comments on Daniel's behalf. She says people love to respond to the comments and it has helped integrate Daniel into the life of the community. She goes on regular runs with Daniel in his buggy, surrounded by groups from the local Brothers Pearse Athletic Club. Daniel loves it. Sinead said it has been like being on a journey, a journey of accomplishment and a journey of acceptance in becoming more realistic about the level of ability that Daniel possesses. Many people in Tallaght have warmed to the family's efforts to help Daniel. Sinead was named Tallaght Person of the Year for her devotion to her son. At the same awards ceremony, teenager Shauna received the 'Heart of Gold' award for caring for her brother. The community has rallied around the family and raised €100,000 to extend and adapt their home to make it a permanent and suitable place to care for him. This has given the couple great encouragement in their dream of not allowing Daniel to be sent away to a residential institution as he gets older and bigger. "Daniel is our world. And we are Daniel's world," she said. Sinead receives the Carer's Allowance, a Domiciliary Care Allowance and a Carer's Support Grant. She said the HSE informed her it would not be providing the behavioural therapist she requested and she was told she could find one herself and pay for it herself. She said she is prepared to fight the HSE to provide the services of a behavioural therapist, as such treatment would allow the family to keep Daniel at home in the future. She says this would be cheaper on the State than full-time residential care. The HSE stated it does not comment on individual cases. A spokeswoman said: "The HSE is currently engaged in a reconfiguration of existing therapy resources to geographic based teams for children to make it fair and consistent. Since 2014, the Progressing Disability Services for Children and Young People Programme (PDS) has entailed targeted investment of €14m and the provision of 275 additional therapy staff, to increase services for children with all disabilities. "The number of staff employed in early intervention services in Children's Disability Services as of January 2015, was 1, 003 whole-time posts, including eight behavioural support staff as part of an interdisciplinary Children's Disability Network Team. "Estimates in 2018 included a proposal for a number of posts to support the implementation of PDS including behavioural specialists." But meanwhile back in the Tighe family home, the stress of Daniel's behaviour is causing Sinead to "feel numb". "It is like my feelings as a mother are being eroded. Daniel is affectionate - but is very rough," she says. "At times, I don't feel much like a mammy. I feel like I'm just a robot." Unacceptable gaps in early assessment and waiting times in excess of a year for vital services such as behavioural therapy, speech and language therapy and psychology, are placing children with disabilities at a huge risk of regression, said Catherine Cox, spokesperson for Family Carers Ireland (FCI).